The age-old story about losing a race because a twenty-five-cent part failed has a modern twist. 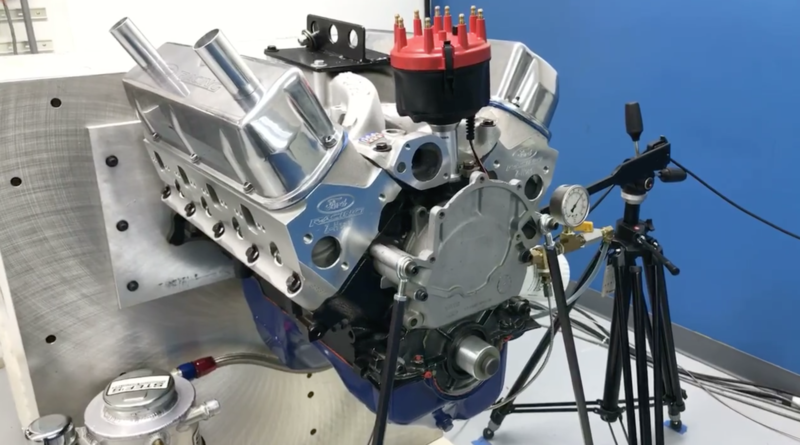 Today, the parts cost a bit more than a quarter, but the penalty for failure has the potential to achieve a $25,000 disaster in milliseconds when an intake valve doesn’t fully close and you pop a blower in the lights, crossing the finish line upside down and on fire. While that may be a dramatic exception as a rule, hundreds of engines and sometimes cars are severely damaged every year because of a failure initiated by a seemingly insignificant part such as a valve adjuster. All adjusters are functionally the same. 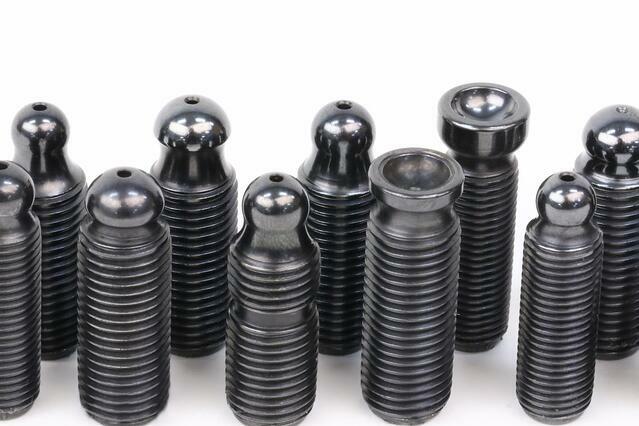 Differences are seen in the type of tip, either ball or cup, and the size and thread spec. Each tip is specifically shaped for optimum compatibility with its counterpart on the pushrod. As the cost of racing continues to escalate, pinpointing the source of expensive failures has driven intense investigation of critical parts that must function perfectly together. The answers are sometimes surprising, but almost always traceable to a design or material deficiency that can be remedied through thoughtful evaluation and subsequent design revisions. 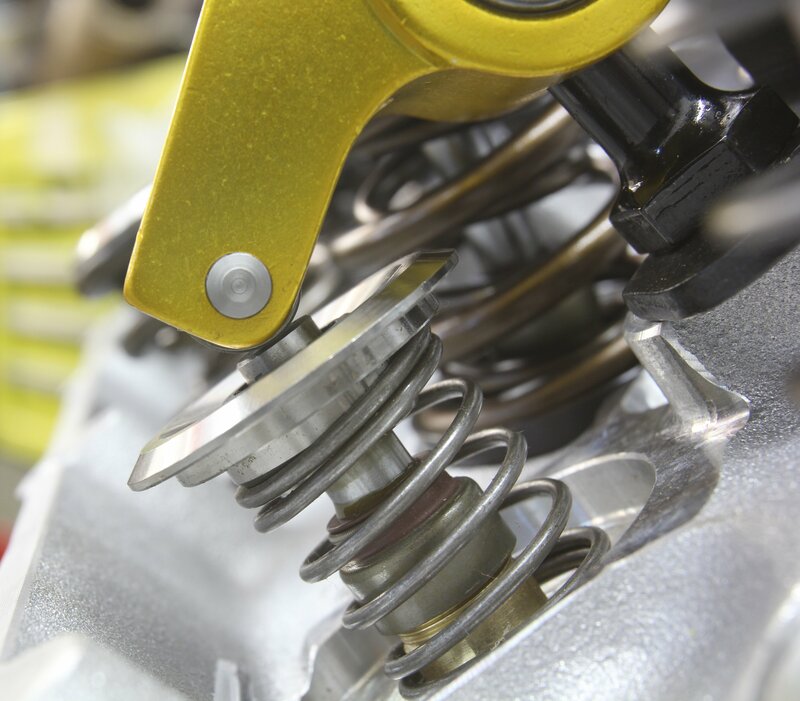 Such is the case with the valve adjusters in rocker arms, parts that for many years have been taken for granted as foolproof. Simple adjusters are the contact point between the rocker arm and the pushrod. They transfer linear motion to rotating motion as the rocker arm rotates on its fulcrum to depress the valve. 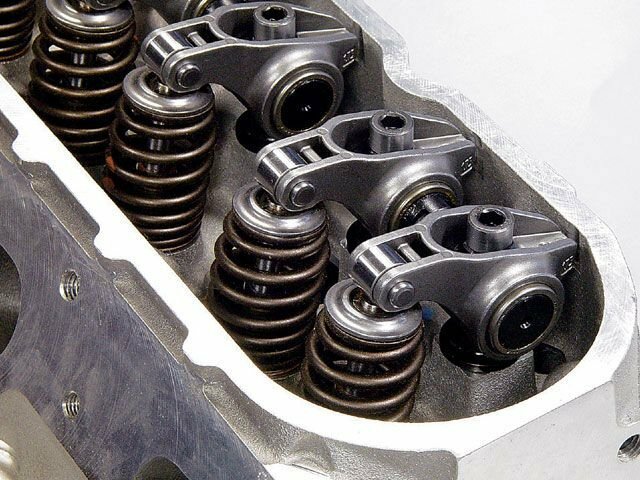 They are a part of sophisticated rocker arm assemblies that have received a tremendous amount of attention regarding weight, strength and ratios. What could go wrong? Well, plenty. Rising cam lift profiles, higher valve spring pressures, severe pushrod angles, vibrating pushrods, inadequate cup designs and materials and poorly shaped adjuster balls are some of the culprits that join forces to convert high powered racing engines into ordinary scrap metal and occasional shop ornaments. 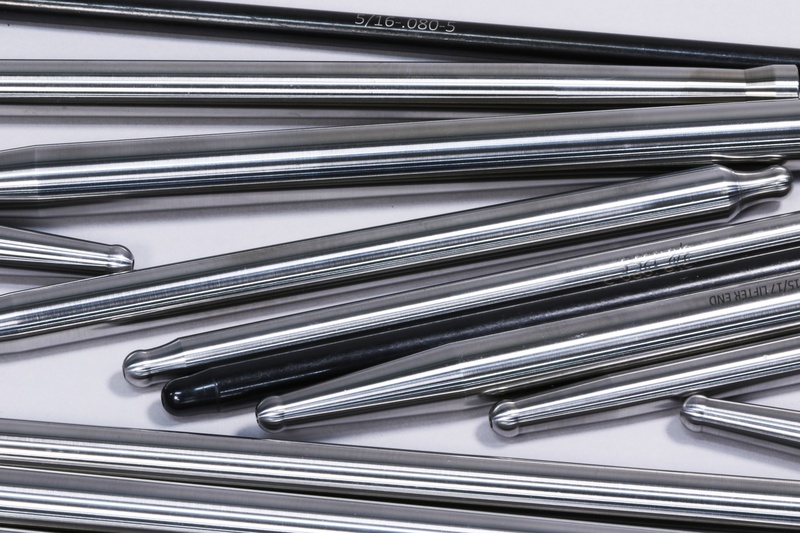 Being a pushrod manufacturer, Trend already had control of pushrod design, quality, and materials. Expanding into the adjuster segment allowed them to ensure that all of the elements of the valvetrain work in harmony. Andy Anderson runs the adjuster program at Trend Performance. We recently spoke with him and he walked us through the mechanical minefield that has brought ordinary adjusters to the forefront in the pursuit of performance gains and durability. The problems first surfaced in the professional ranks, particularly in NASCAR, Pro Stock, Pro Mods, Alcohol and Top Fuel Funny Cars and Dragsters and even other venues such as tractor pulling. 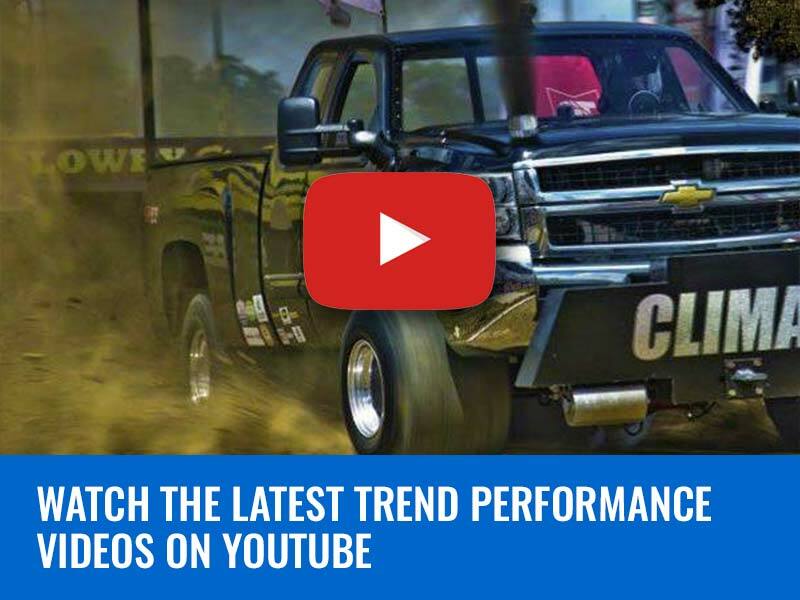 Trend Performance had to address it because they found themselves having to make pushrod modifications to make up for inadequacies in existing adjusters. 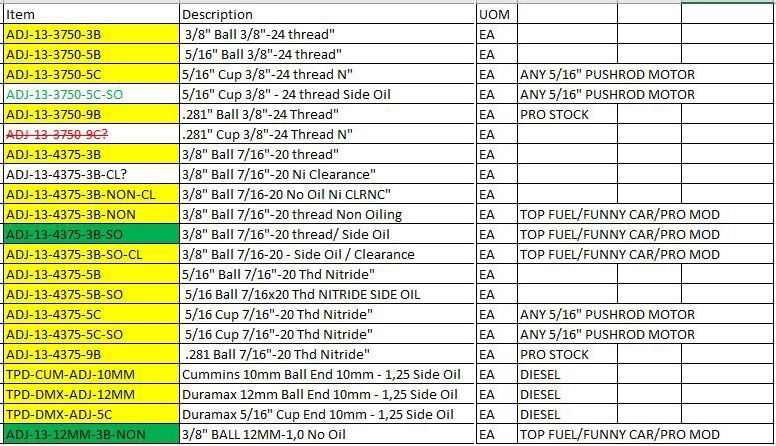 Metric sizes are also included in this variety of adjusters designed to accommodate popular applications including Cummins and Duramax diesels found in the accompanying chart. 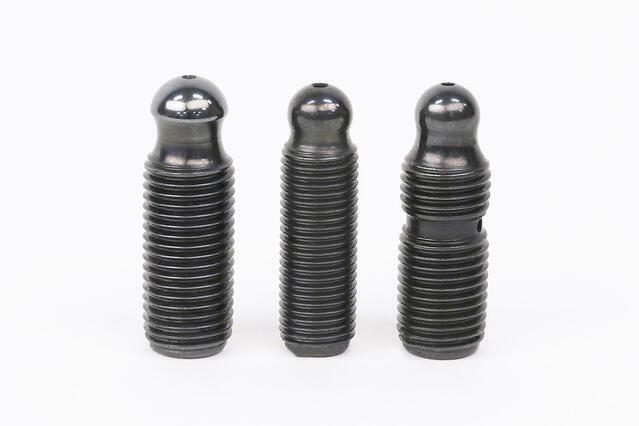 In each case, the ball tip or cup specifically relates to a Trend Performance mate on the pushrod side. The problem is fundamentally a geometry and fitment issue. Some adjusters have a ball interface that runs in a pushrod with a cup on top. Others have cups and work with pushrods having ball ends. Some of them oil through the pushrod and some don’t, but the operating interface is always a ball/cup arrangement and the critical challenge is seen in the shape and fitment of the two parts. With mass produced parts by many different manufacturers, the ball and cup socket were frequently a bad match. Trend determined that it would have to start making compatible adjusters to sell with its pushrods. The adjusters would fit other manufacturer’s rocker arms and ensure a proper fit between the adjuster and the pushrod. Currently available adjusters can be paired with any Trend Performance pushrod to achieve maximum compatibility and solid insurance against unwarranted failures. This chart indicates whether the adjuster is oiling, non-oiling or side oiling. Note the diesels are side oilers and the Fuel car applications are either non-oiling or sider oiling. Incompatible components encouraged failure because the parts would limit lubrication under the highest load and awkward geometry conditions. The shape of the ball and the cup were often incompatible or poorly sized because the components came from different vendors with different levels of quality control. Trend reasoned that it should make adjusters to fit its pushrods properly and the easiest part would be making the adjusters compatible with existing rocker arms. The cup or ball on Trends adjuster tips incorporates compound curves designed to match their ball or cup mates on the pushrod tip. The curves are uniquely shaped to direct the load where it belongs and maintain the best possible lubrication. The ball and cup must match correctly, but that doesn’t mean the ball is a perfect size and fit with the actual shape of the cup or vise versa. There has to be appropriate clearance in one or the other. Considering the range of motion and loading the ball tip is made smaller than the cup and is often shaped differently. That’s critical because race engines with big cams and lots of spring pressure exert pushrod loading that can easily buckle pushrods and squish the oil film to the point of metal to metal failure and all new scrap parts. The ball/cup arrangement is still the best interface out there, but it clearly required refinement in the face of increasingly hostile conditions. This selection illustrates some of the variety of pushrod tips that require a compatible mating surface on the adjuster. All these tips provide upper oiling via the pushrod except the one solid tip which is lubricated via the rocker arm through an annular port on the adjuster. So, a great deal of Trend’s engineering time is devoted to designing adjusters for specific applications using Trend pushrods. 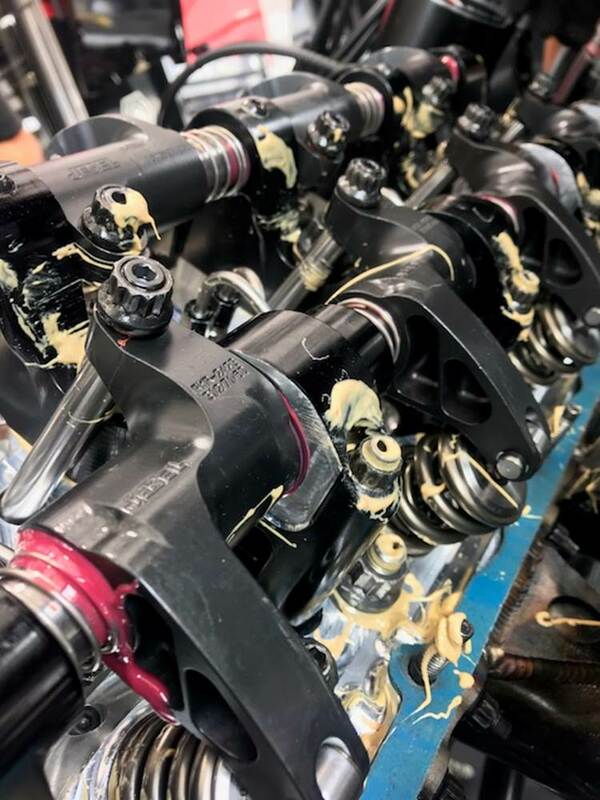 Racers can purchase the correct pushrods and adjusters from Trend and swap out the adjusters in their rocker arms for better performance, or simply as a maintenance upgrade. On the surface, the adjusters will look very similar, but subtleties in the shape make all the difference when mated to a compatible pushrod. The secret is in shaping the components to absorb maximum loading at extreme angles while retaining space for lubricant to flow freely. Compound curves are used to make the pushrod hit where they want it to in the cup. A comparator is used to verify shapes as part of the quality control. 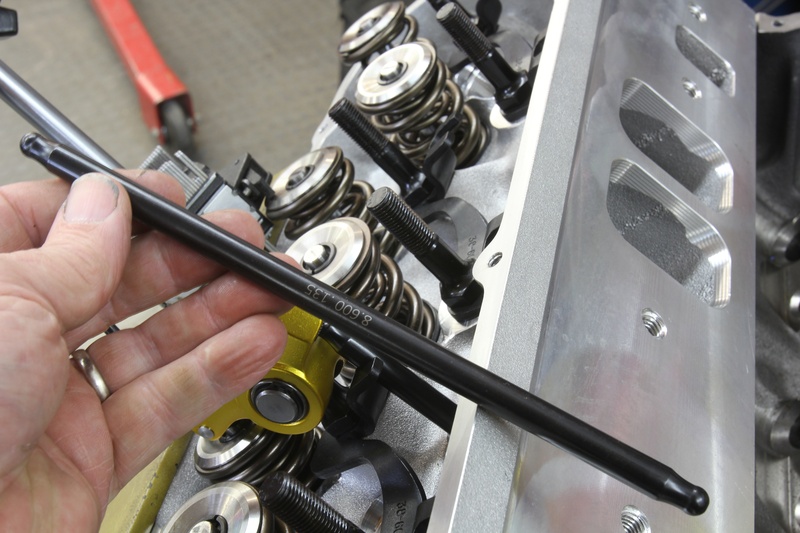 Shown is a set of Trend pushrods and matching adjusters at work in a high-strung hemi drag racing engine. Making adjusters and pushrods with well mated surfaces is the primary goal, but Trend strives to make its adjusters even better than those they will replace. 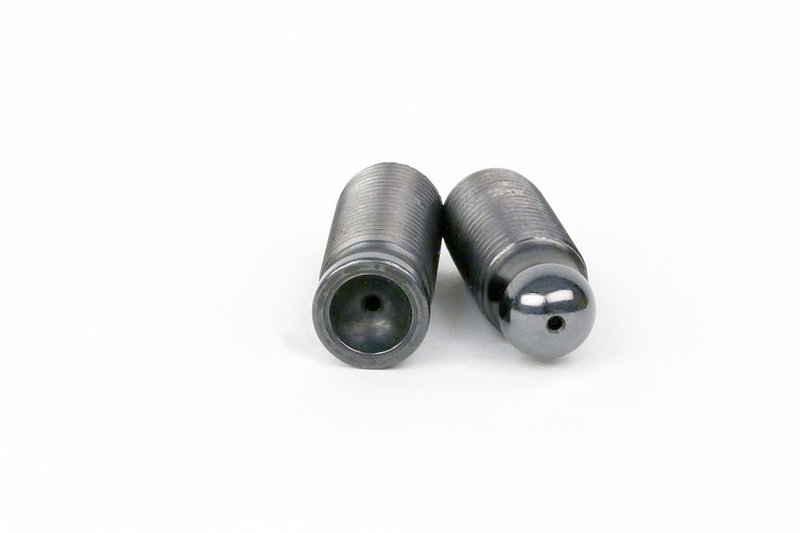 The manufacturing process and heat treat are all designed not only to improve compatibility, but to provide a better piece for the rocker arm. That means rolling the threads round top and bottom and drilling the oiling hole in the right position. 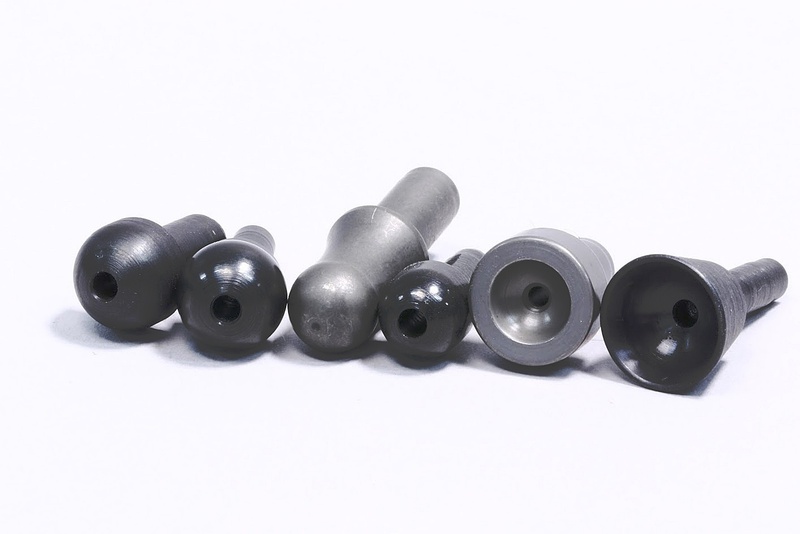 For some applications the cups for the rocker arms and cups for the pushrod are made of different materials and the adjusters are nitrided. Almost all pushrods and adjusters with ball ends now incorporate 270 degrees of freedom, meaning the angle must be quite severe before the pushrod body will contact the adjuster’s perimeter; a problem that sets off a chain of mechanical distress that seldom ends well. It means that the ball portion is full round for 270 degrees and the neck is smaller to prevent contact. A 3/8-24 adjuster with a broad 3/8 ball radius and through oiling. A 5-16-18 tip with oiling hole and a 3/8-24 adjuster with through oiling and annular oiling groove for the rocker arm. Trend now makes about twenty-one different adjusters for 5/16. 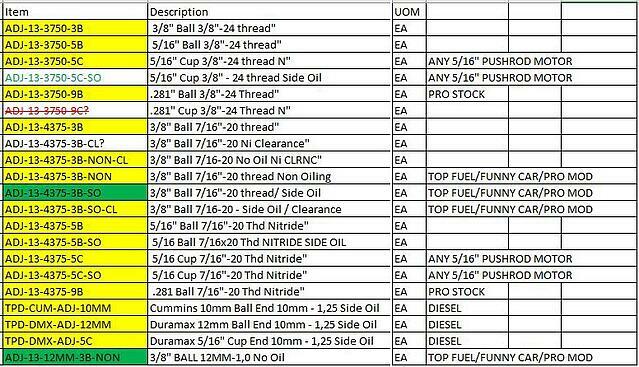 7/16, and 3/8-inch pushrods and special ones for the larger Pro Mod and Fuel categories. 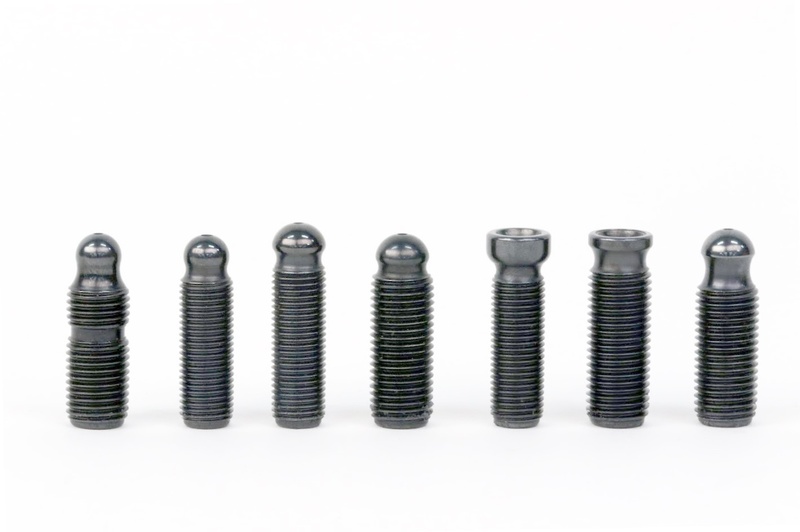 They also have adjusters for MJ 12mm x 1mm and 10 mm x 1.25mm. And they will make whatever you need if required. Further, they stone and polish all the adjusters to a super fine finish. This attention to detail is often recognized and spawned in the profession racing ranks and Trend, being a leading supplier, is at the forefront of adjuster technology and the precise manufacturing requirement necessary to provide fully compatible parts that will withstand the abuse levels heaped on them by pro racers. And, of course, the technology is available to anyone, so sportsman racers of all kinds can equally benefit.